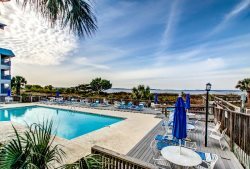 This adorable 1 bedroom, 1 full bath condo located at the Savannah Beach and Racquet Club on the quiet North end of Tybee Island. Just a few short steps from the pool and Beach area offers all the amenities needed for a fun filled vacation for your family. The full size refrigerator, microwave and apartment size stove make the kitchen a nice alternative to eating out. Queen bedroom and sleeper sofa unit will sleep 4 comfortably. Elevator access. The Savannah Beach and Racquet Club. Located on the quiet North End of Tybee Island directly on the Bay where the Savannah River meets the Atlantic Ocean. Watch the dolphins play and the ships coming to and from port. The condo complex features private beach access 14'X20' pool and 10'X10' kiddie pool, tennis courts, private parking, and gated complex. WIFI access is located at the pool area between the A and B building. Coin operated laundromat on site.